Detail of 1/4 acre installation from "Domestic Nature" exhibition. In 1987, after eighteen years as a professional ceramic artist, I began creating sculpture and installations to explore the links between local daily life and environmental issues. For me, this venue retains a healthy ceramic work ethic: community-oriented, earth-based, labor-intensive, direct. More than visualizations of obvious connections (domestic to industrial, natural to human design), this genre can critique precarious situations while implying hope through community action. 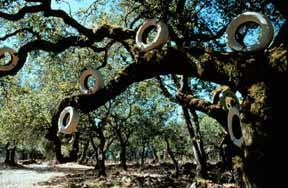 Working with everyday household objects and industrial materials culled from local waste streams, and adding organic elements such as endangered native grasses or fruit trees, I construct both large-scale installations and humanöscale assemblage in publicly accessible locations. Most are temporary. Many are audience interactive. Collaborations - with public school students, community action groups, community college horticulture students, public infrastructure staff, and other artists - are natural to this methodology. The fruits of this work are the one-to-one and the public discussions it generates. The best of assemblage makes extraordinary connections between ordinary materials. Collaborative assemblage installation in community settings with indigenous materials can create positive connections between us and our environment. It's a possibility. All text © Susan Leibovitz Steinman.